Dave from My Year on the Grill chose leftovers as this week’s “ingredient” for the Blogger Secret Ingredient contest (aka BSI). Since I often make dishes with leftovers, I had a tough choice choosing which one I’ve made lately to post. And since the things I made with 28 egg yolks leftover from my huge white birthday cake all included lemon, I chose to post something more season-appropriate. Don’t you hate it when a recipe calls for 1/2 cup of pumpkin, or any other measurement other than the entire can? Drives me crazy! After using 1/2 cup for some yummy bagels, I decided to use the leftover to make pumpkin butter so I could smear that on the bagels with some cream cheese. 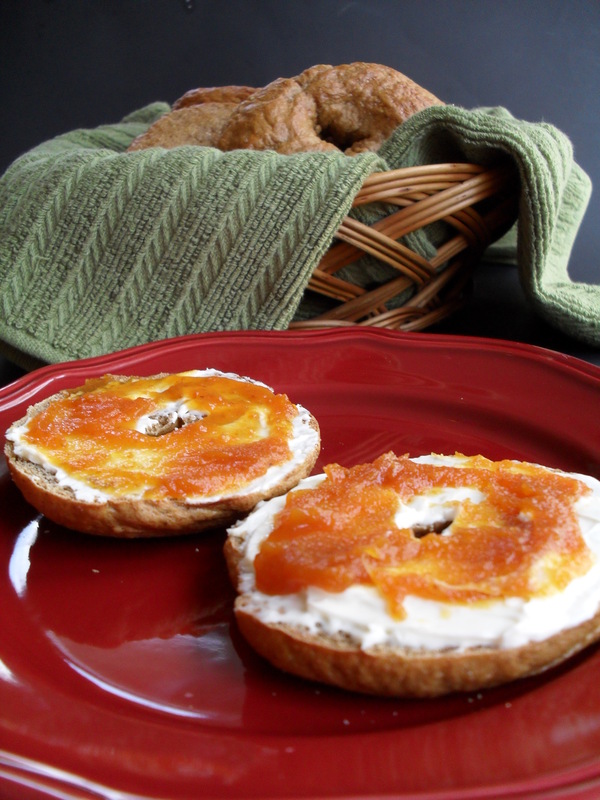 The bagels are good by themselves, but even better with the pumpkin butter! 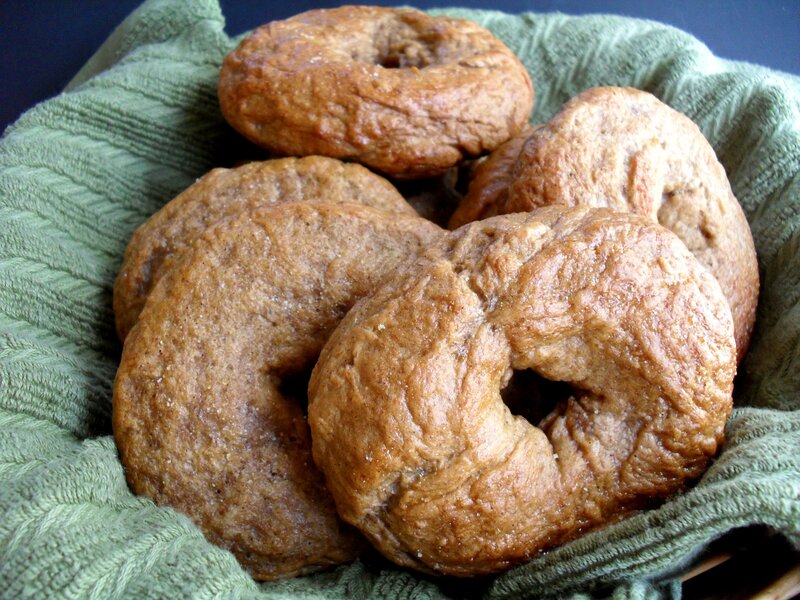 And don’t worry, your pumpkin bagels will not be as dark or flat because you will not mess up the recipe by adding so much water that you have to add in 1/2 cup of whole wheat flour to stiffen it back up, and you will not forget to put in half the yeast. Although these mistakes made the bagels more dense than I would have liked, they were still quite tasty and I will definitely make them again. In bread machine pan, place water, pumpkin, brown sugar, salt, spices, flour and yeast in order suggested by manufacturer. Select dough setting (check dough after 5 minutes of mixing; add 1 to 2 tablespoons of water or flour if needed). When cycle is completed, turn dough onto a lightly floured surface. Shape into nine balls. Push thumb through centers to form a 1-in. hole. Stretch and shape dough to form an even ring. Cover and let rest for 10 minutes. Fill a Dutch oven two-thirds full with water; bring to a boil. Drop bagels, two at a time, into rapidly boiling water. Cook for 45 seconds; turn and cook 45 seconds longer. Remove with a slotted spoon; drain on paper towels. Whisk egg white and remaining water; brush over bagels. Coat a baking sheet with cooking spray and sprinkle with cornmeal. Place bagels 2 in. apart on prepared pan. Bake at 400° for 15-20 minutes or until golden brown. Remove to wire racks to cool. Whisk together in small saucepan and cook over medium heat, stirring frequently, until reduced half. Posted in Bread, Condiments & ETC. and tagged bagels, butter, leftovers, pumpkin. Bookmark the permalink. Beautiful Veronica. How cool you make your own bagels now. YUM, homemade bagels.. Don’t worry, everyone flubs up once in a while, i think i put too much salt in my ciabatta dough, we’ll see if it works out. Love the pumpkin butter! Your bagesl look good V and that butter..whoa! Too funny! I have a recipe that I have been meaning to make for a long time! 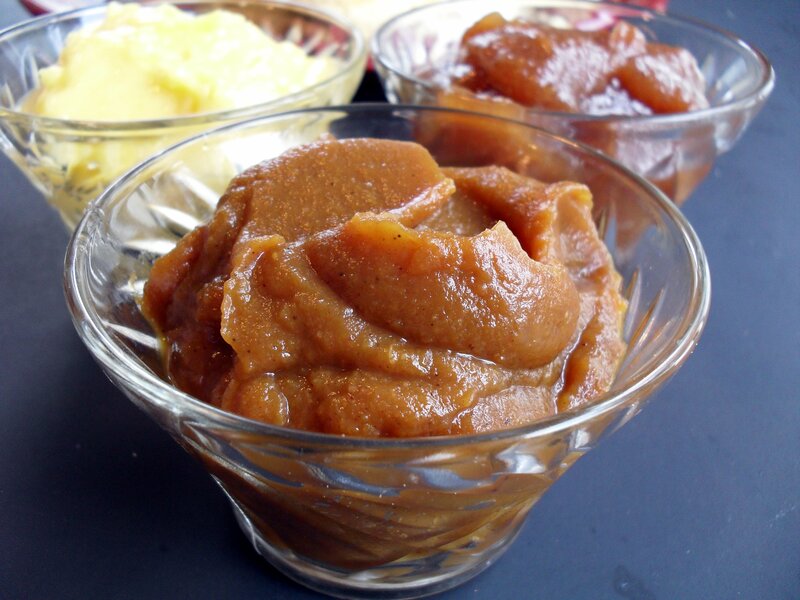 Plus, I JUST saw another recipe for pumpkin butter and thought about how good they would be together. Then I open up my email and here is your recipe!! Thanks! Your bagels are really impressive! The spreads are a great way to use up leftovers…and what a yummy toppings bar they make! Um, pumpkin spice bagels?! Sign me up! The bagels sound great, but the butter sounds amazing! What a great creation!! I swear I thought I commented on this……I am going to try this. I have been buying pumpkins like it is my job! what a wonderful collection of recipes. i’m a baker and i’m very excited to try out some of your posts. the recent decadent chocolate cake is mind blowing but i’ll start out with the cookies. Thanks for your comment–I’m excited to meet another baker! It’s my passion. I recommend the brown butter chococolate chip cookies and the loaded oatmeal–they are my favorite!